flash the "High Sign" at the baseball diamond where Keaton played as a kid. Our every gracious hosts, the D'Alcorn's, at Jingles Jungle. 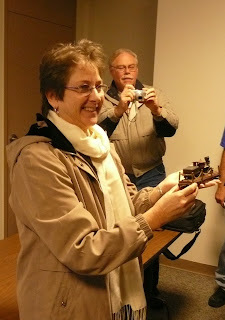 Melissa Talmadge Cox, Buster's grandaughter, shows off "The General" during Saturday's talks at the convention. 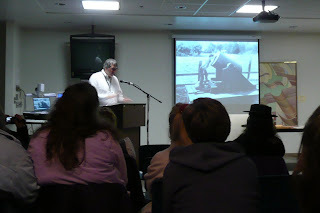 Britian's David McLeod again presented his running series on Keaton features, this year is was "Seven Chances". 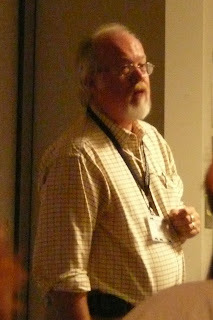 As was the presentation on "The General" by Ted Keaton III. 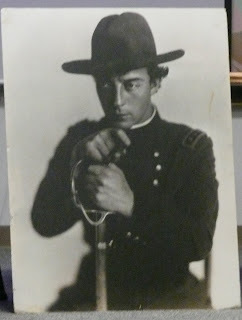 The annual auction included shots of Keaton in uniform - both large and small. Saturday concluded with a performance by the West End Jazz Band at the glorious Frauenthal Theater. And, of course, the incredible Dennis Scott at the Barton Theater Organ, performing for Keaton's Masterpiece, "The General".